This tool evaluates the natural exponential to a number: ex . Enter the the argument x below. The graph of the exponential function is shown in the figure below. 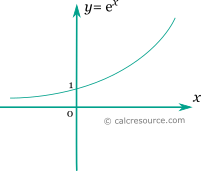 It is a monotonic function, that its value and its slope at 0 is 1.